This week at Van Clan we’re delving into the world of the Tiny House, exploring the different shapes, sizes and options out there for those that want to leave the city and live their lives in a tiny home. 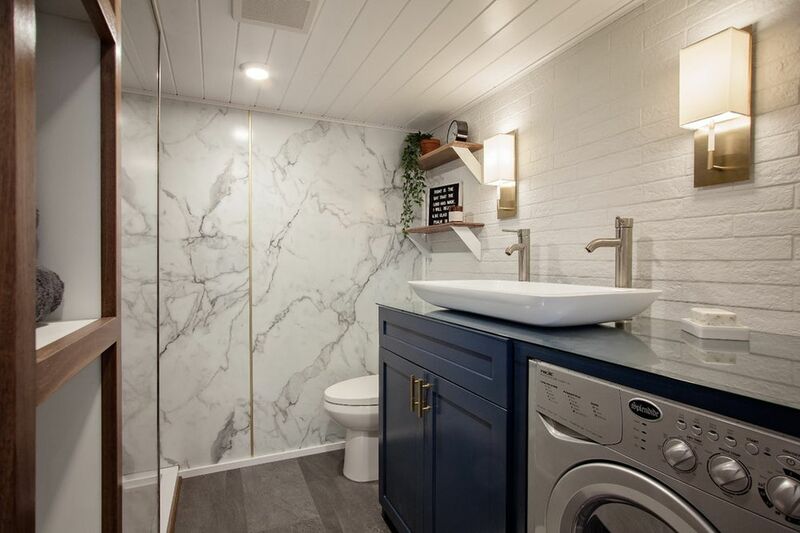 As you’ll see from this next example of small alternative living, having a tiny home doesn’t mean that you have to have small ideas, far from it! In fact, if you’re looking for a house that rocks harder than Motley Crue at a free bar then you’ve certainly come to the right place! 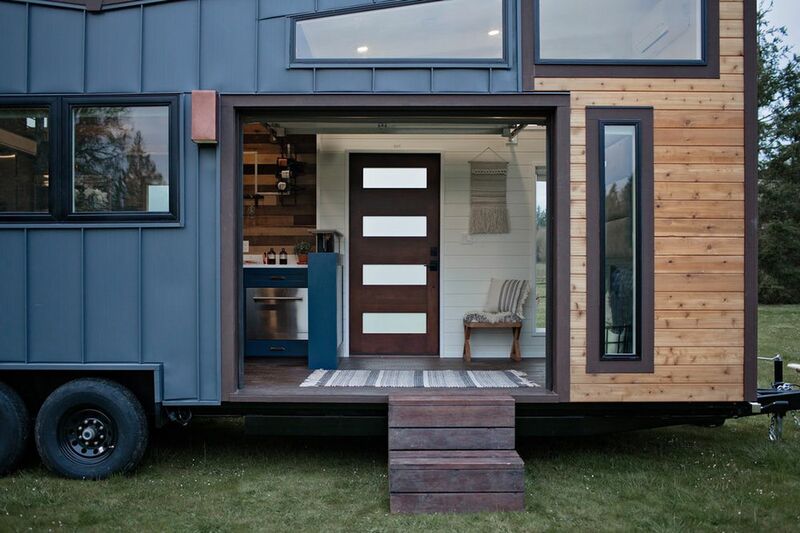 Meet The Breezeway – The Tiny Home That Knows How To Party. So picture this scene – you want to invite your mates over to your van for a meal or a get-together and you quickly realise that there’s not much that you can do in 80 square feet. Van’s aren’t really built for entertaining, in fact living in a van can be quite lonely unless you have a regular meet up with other vandwellers. 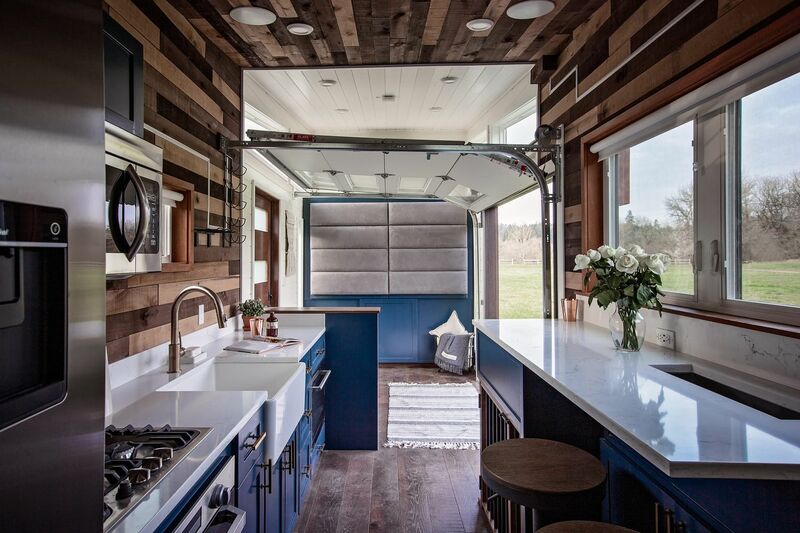 Tiny home enthusiasts also know this feeling, but the Breezeway blows that problem completely out of the water, giving you a party pad on wheels that’s ready for any occasion. 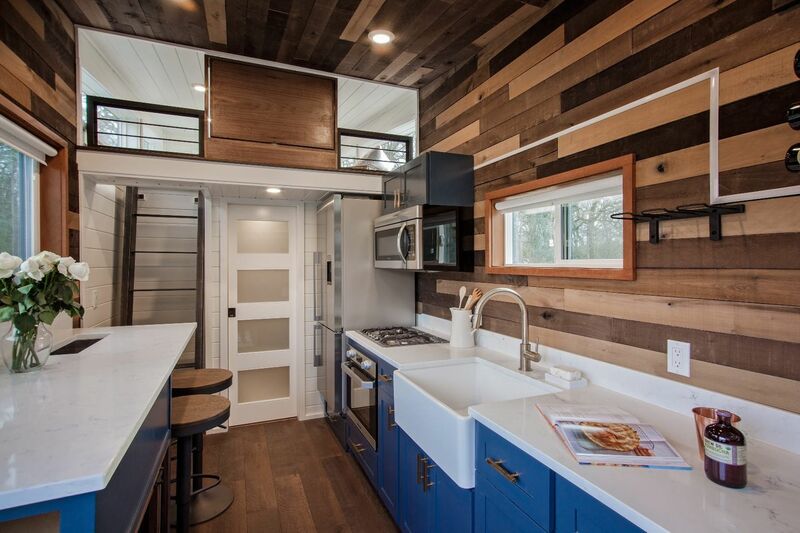 The garage-style roll up door on this tiny home is pretty big, and that’s a specific design choice. 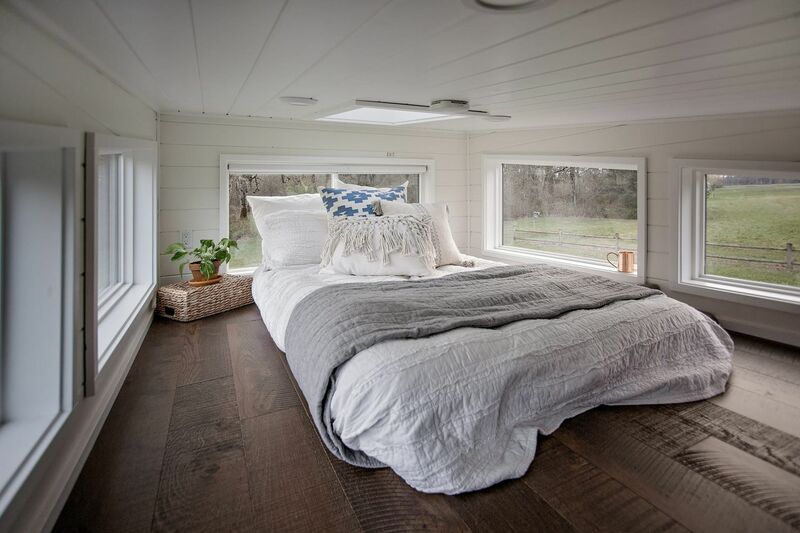 The genius minds over at Tiny Heirloom who came up with the concept of the Breezeway realised that tiny house dwellers love the outdoors, so why not bring the outside in! Now you can invite all of your old neighbours round for a housewarming party and not feel embarrassed about them all being stuck in one corner next to your toilet! Tell Us More About This Tiny Home! The Breezeway is a 32-foot tiny home with a sweet butterfly style roof. The bedroom area is light and airy with enough room to move around in freely, and because of the ingenious design of this build you now have more living space on a single level, making your tiny home seem far bigger that it actually is (it’s like an optical illusion, but this time it’s one that we don’t mind looking at again and again). The concept of twinning your indoor home with the outside world is one that we often hear in van life stories, but Tiny Heirloom have built a space that carries out this concept so effortlessly that you hardly notice the transition from nature to sofa. There’s even a washing machine hidden away in the fully kitted out bathroom! 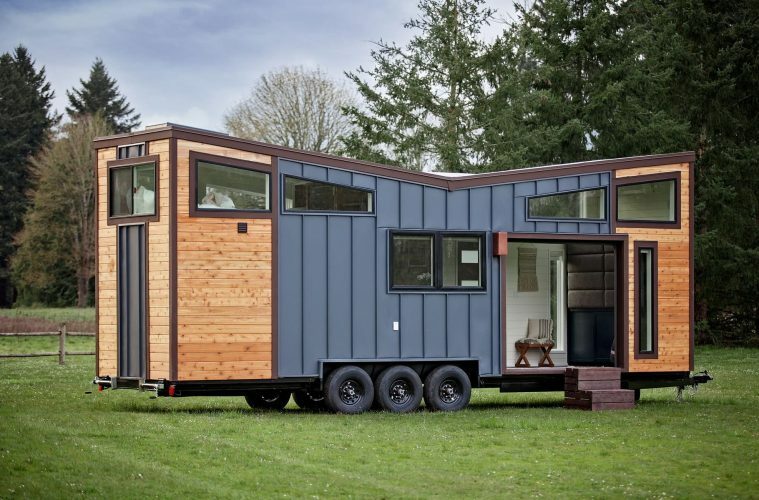 This tiny home just keeps getting bigger and bigger! How Do I Buy A Tiny Heirloom Tiny Home? Visit Tiny Heirloom to find out more about their custom and signature builds. Prices start from around $44’000 (around £34’000) and there’s so much to choose from. Buy a ready made design or work with the company to create brand new and exciting ideas that are outside the box just like the Breezeway here. We love what Tiny Heirloom have done with the Breezeway; it’s got everything and more that you could need if you’re planning on living off the grid, and it’s certainly got a lot more inside than the van that we live in full-time. If you’re looking for an off grid home on wheels that’s got a bit more room that a retro camper trailer but doesn’t cost EarthRoamer style prices then a tiny house could be the way to go! Looking for a new place to adventure? Try Van Life Australia. One great addition to this tiny home – the Biolite Campstove. Team it up with a Titan Underwater Drone and you’re basically the next James Bond.